I got home yesterday after a long walk in Central Park with Trevi and a girlfriend, and all I could think about was muffins. Well, first I watched an episode (or two) of Nashville and THEN it was muffin-brain. I'm not sure why, but I had this compulsion bake. 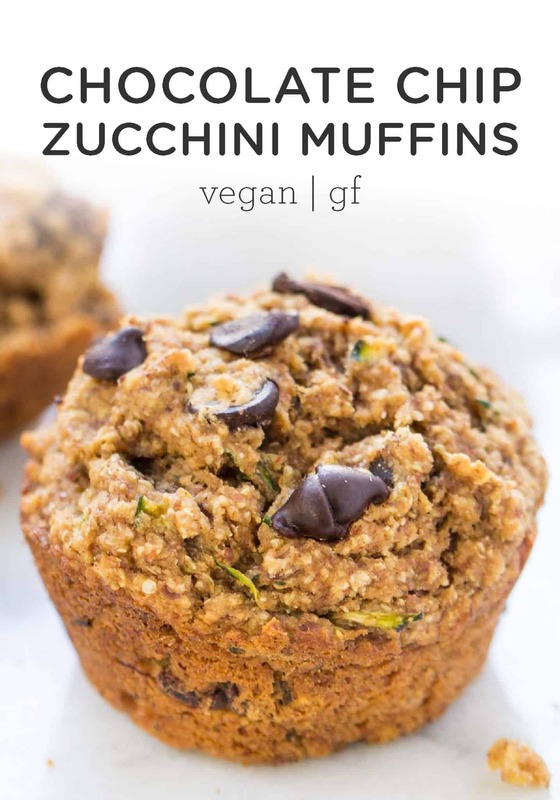 I had picked up some zucchini at the market, planning to use if for a spiralized dinner, but for some reason I just had to have zucchini muffins. 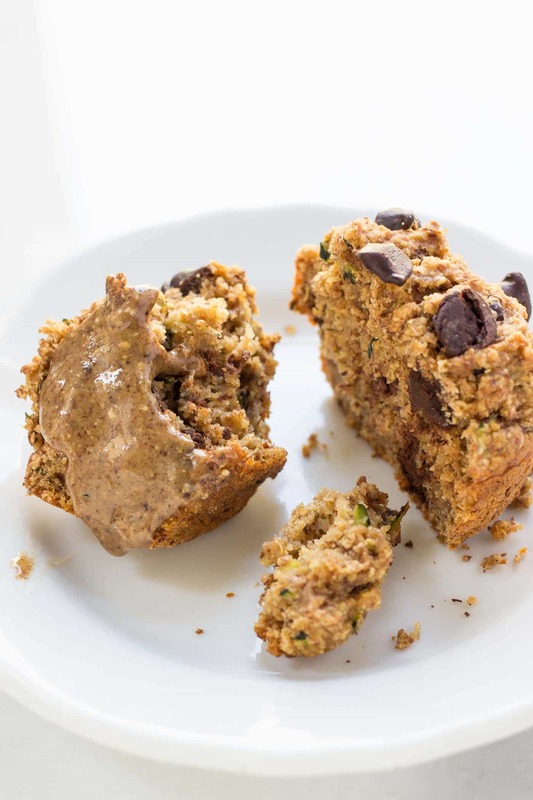 So I turned to my trusty quinoa muffin recipe, gave it a few tweaks and here we have it…chocolate chip zucchini quinoa muffins! 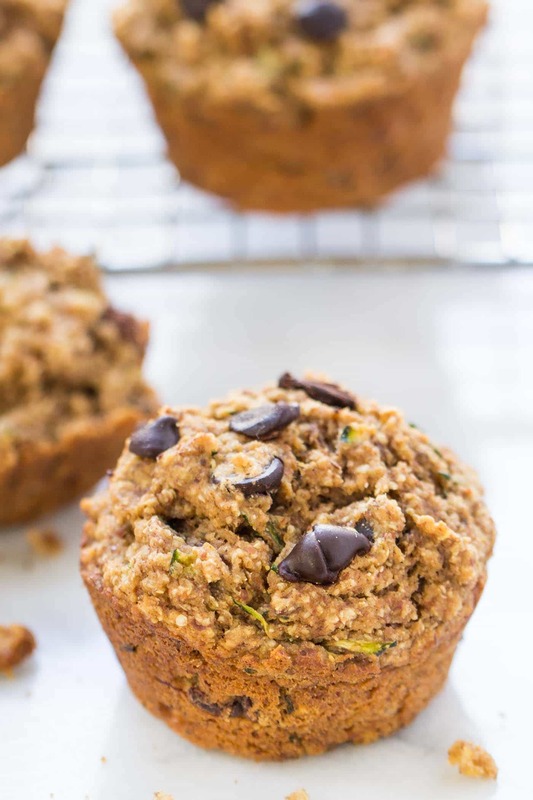 What I love about this muffin recipe is that it uses really basic ingredients (except for maybe quinoa flakes…but you know how much I love baking with them! ), and it's really healthy. It's basically just like oatmeal, with a little fruit and natural sweeteners, turned into muffins. 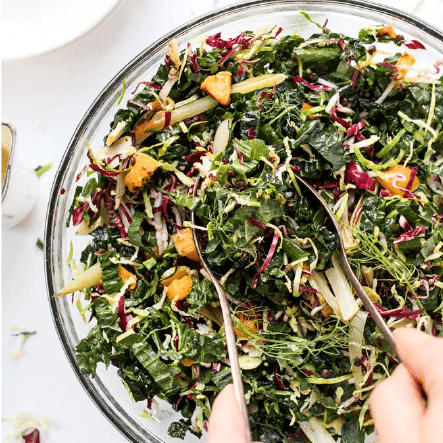 There's no eggs, oil, dairy or gluten in sight! One of my favorite flours to bake with, besides quinoa flour, is oat flour. For starters, I love that you can make oat flour at home in a blender. Second, it's super affordable, especially if you buy oats in bulk (just remember, if you're celiac or have a severe gluten intolerance, you should purchase gluten-free certified oats!). Also, oat flour helps keep baked goods super moist AND it's nutritious! Not only do I adore how versatile oats are — like honestly you can use them in baking, for cereals, granolas, and so much more — but oats they're actually quite good for you too. Oats are really high in dietary fiber, which makes them a great breakfast food because they’ll fill you up and also help to stabilize blood sugar. Oats also contain some protein (definitely not as much as quinoa, but that's okay!) as well as trace minerals like iron, magnesium and phosphorus. Basically…these muffins are rockstars. 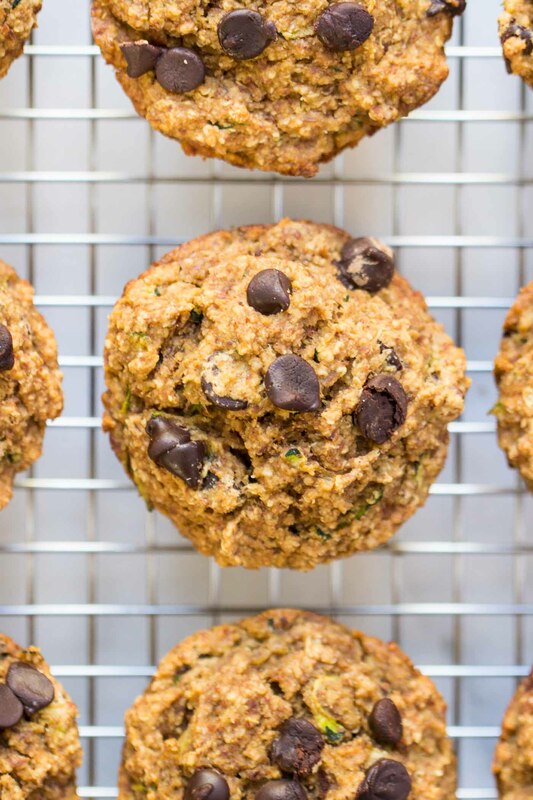 They're healthy, filling, a perfect breakfast treat AND they taste freaking awesome. If you're also feeling the need to get your bake on, then I highly recommend you whip up a batch of these babies. 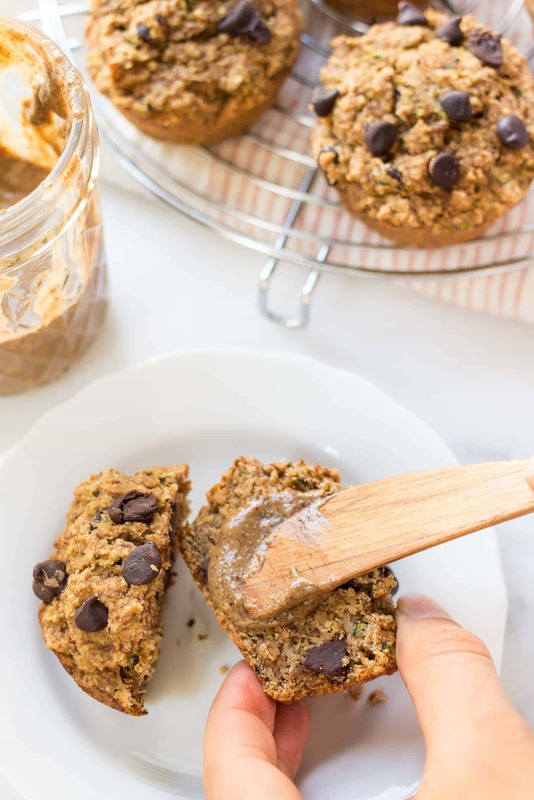 They're so simple and you'll have a healthy breakfast treat (or snack) for the rest of the week! So excuse me while I go heat up another muffin and slather it in my favorite homemade nut butter (cinnamon maple pecan)! 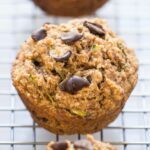 What I love about this muffin recipe is that it uses really basic ingredients (except for maybe quinoa flakes...but you know how much I love baking with them! ), and it's really healthy. It's basically just like oatmeal, with a little fruit and natural sweeteners, turned into muffins. Make the flax egg by whisking together the flax and water. Set this aside to gel while you prepare the remaining ingredients. Whisk together the dry ingredients (minus vanilla extract if using) in a large mixing bowl. In a separate bowl, beat together banana, applesauce, milk and syrup. Whisk in flax egg and pour wet ingredients into dry. Stir to thoroughly combine (the batter will be kind of thick, but still stirable and soft). Fold in the zucchini and chocolate chips. Fill each cup ¾ of the way full. Add water to the ones that are unused. Sprinkle the tops of the muffins with additional chocolate chips if desired (it makes them uber chocolatey and pretty!). Bake on the center rack for 23 - 25 minutes until a cake tester inserted into the center comes out clean. Cool in the pan for 5 minutes, then transfer to a wire rack and cool completely. 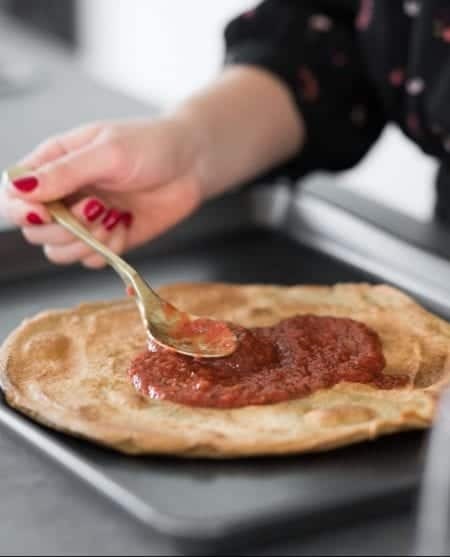 If desired, reheat in the toaster oven or in the microwave and top with nut butter (optional, but highly encouraged). can this be made as a bread in a loaf pan instead of as muffins? I haven’t tested them that way, but I think it probably would! I’ve heard quinoa flakes can taste bitter. (Just like standard quinoa, which I always rinse and/or soak before cooking). So can I rinse the quinoa flakes before using in this recipe? Or would that affect the texture (since the flakes would be wet)? Thanks! Have you ever substituted the zucchini with carrots? I haven’t personally, but I think it would be delicious! Your instructions number 4 list pumpkin which is not listed in the ingredients. Guessing that is just a mistake. Just discovered your website and and wait to get started baking cookies etc. I only have one recipe for quinoa chocolate chip cookies. I usually add cooked quinoa to my cooked steel oats in the morning. Your have so many great recipes I having a hard time deciding which one to make first. Yep! It should have said applesauce 🙂 And yum, that breakfast sounds so great! Could I use coconut flour instead of almond flour? my husband can’t eat almonds. Unfortunately coconut flour can’t be substituted for most flours. 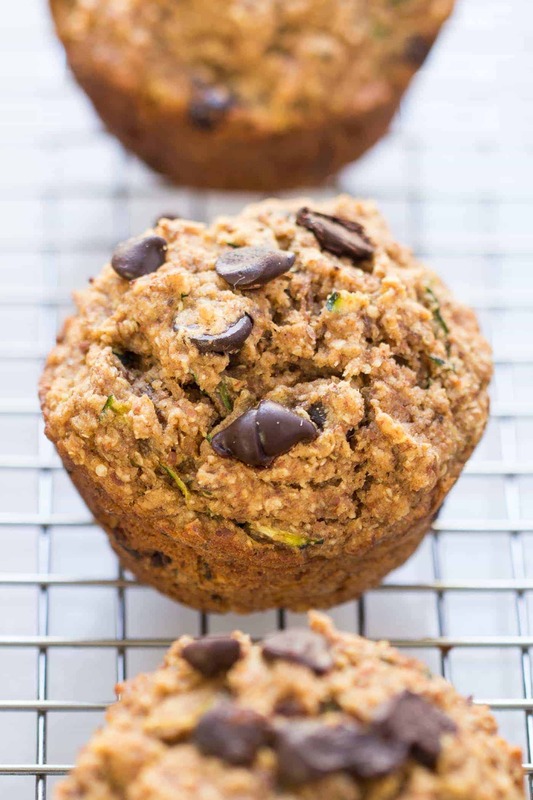 You could try adding in more oat flour! 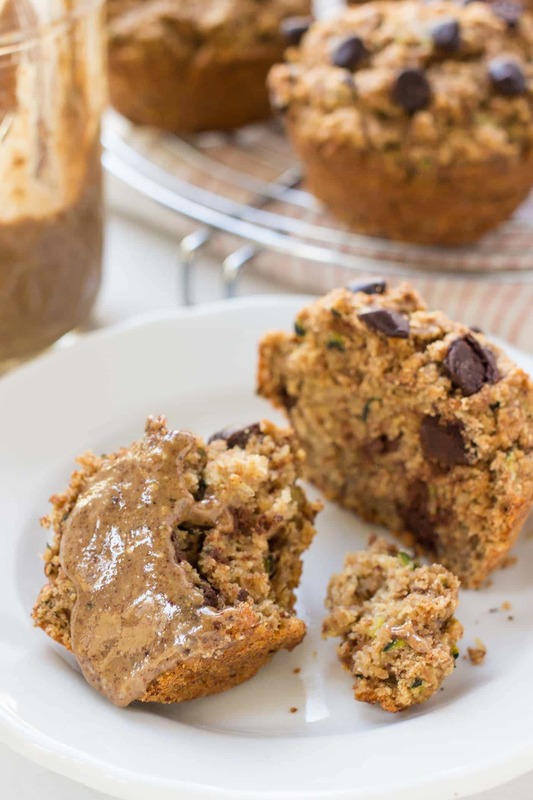 These muffins look delicious and perfect for summer when zucchinis are everywhere! I love making mini muffins for my kid’s lunch boxes (and my mouth!). My kids favorite combo is banana with chocolate chips and I love apricots and almonds in scones but would probably be great in muffins too. 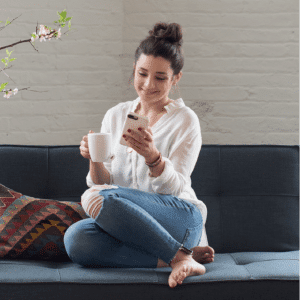 Hi Alyssa just wondering if quinoa flakes are the same as quinoa glow flour . Looking forward to making these.They look great! Nope! Actually flakes are like rolled oats and the flour is like a traditional flour. If you can’t have flakes, you could substitute them for quick cooking oats! Hi, can’t wait to make these. 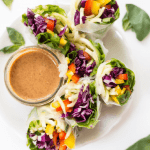 I have several friends who have gone gluten-free and I’ve been looking for gluten free recipes. Did you use rolled oats or another kind like quick? Thank you so much; so happy I found your site on Pinterest. hi,made a double batch on sunday and there almost gone…. do u happen to have the nutrition facts for these ? Do you think there’s a way to do this without oat or almond? I am having to avoid those as well. Maybe brown rice or tapioca flour? I’m honestly not sure…I haven’t tested them without those two, but I’d love to hear if you give them a try! 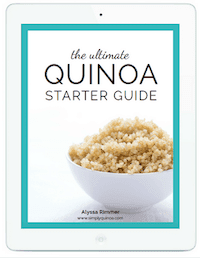 You can just substitute quick cooking oats and maybe stir in a bit of cooked quinoa. As for applesauce (that’s what you meant, right?? ), you can substitute another fruit puree like pear, banana, squash, etc. Let me know how they turn out for you! These are SO amazing! Moist, delicious – just incredible! I had to bake mine about 31 minutes but probably just explained by different ovens, etc. I LOVE great gluten-free vegan baked goods. Thank.you for this recipe! You could try another fruit puree like applesauce! As for recommendations, everything you post is SO yummy, so I trust you completely! Haha. Have you ever tried lemon blueberry? That's one of my favorite combos right now!